Nestled in the depths of the forest, illuminated by the warm rays of the sun, laid the Rogue stream. The water is clear and full of fish. Sometimes in the stream can be found some special stones. Surrounded of bushes, and in some places it is crossed by small fallen trees. There are protruded stones from it, most of which are covered with moss. Often people come here to fish. Jake padded up to the stream, his mind not really with him, nor was his heart. They had remained at Raizils side when his body had been forced away. Only his mind returned when the sudden chill of water creeped up his leg. Snorting, the black wolf stepped back, as he slowly realized what had happened. He put his head down, lapping at the stream. Then he padded to a spot where the sun hit a bit of grass nearby. Circling twice, he laid down, where he continued to cry for his foolish love of the werewolf girl in a vampire clan. Raizil arrived at Rogue stream and saw Jake in wolf form. She walked over to where he was and setting her stuff down she moved in front of him. She reached her hands out and rubbed his beautiful black velvet like fur. "Dont cry Jake, you arent supose to cry. I am, we need to go. Because I kinda just got myself banished from Crimson fang, and if they find us here we could be in trouble." Raizil said with a smile. She didnt say it, but her words implied that she had chosed Jake over Casper and Crimson Fang. Jake oppened his eyes as he felt hands on his fur. Fear was contained withing the dark green circles on his face. But once he saw it was Raizil it dissapeared instantly. A smile sprouted, then he listened her words. He looked at the girl in awe. "You shouldn't have done that. Crimson Fang was your home. But I can't say I'm not happy you picked me." He said in his gutteral wolf voice, before becoming a young, blonde, light green eyed boy. He smiled as he reached out, placing a hand on her cheek. "Your right, we should go. I don't want to get another one of these, but I'm sure I'd give a few too." He said, using his other hand to gently point to the fresh bruise on his face. Then he dropped the hand pointing to his face, content to just look in Raizil's red eyes. Raizil smile when Jake's cocky attitude shown through. "It was my home but not anymore. You know they say home is where the heart is." She then touched his cheek gently before she kissed his bruise. "There feel any better? "She didnt know how Jake had come to make her want to give up everything just for him. She had never been that kind of woman before, but some things do change after all. Jake smiled a cute, yet crooked smile. "Much better." He said happily. "Don't mention me crying to anyone, please." He asked, a second of fear in his eyes. He lipped his lips nervously. "Could I ask you something?" He asked. He shifted slightly to make himself more comfortable. Raizil laughed, "I won't mention it to anyone if you don't mention me crying." Her face got serious though at his next words. "You can ask me anything you want." He smiled at the crying comment, nodding in agreement. "I-I want to kno why you gave everything up, for me. I'm just another guy, nothing special." He said nervously. He was showing his sensitive, sweet, caring side that he only showed his little sister. This side of him was also a little insecure. Raizil thought hard about his question. She herself wondered why she would do something like this. She smiled and answered his question, " Because he made forbid me to leave my room, and if I did he would banish me. But to me it felt like he was forcing me to choose between you or the clan. And I chose you. You have found your way into my heart now Jake, and there are few people who have had that privilege. So in a sense I chose love over friendship." Jake smiled at her answer, but a realization came over him. "I have nothing to do of that magnitude for you. I'm so sorry Raizil." He said looking down at the ground. "I would easily do the same for you, no questions asked, but I won't be able to prove myself. There is no leader of Moonclan who could make such a threat to me." He said, looking up at her sadly. Raizil just looked at Jake. She had her suspicion that they didn't have a leader but didn't know for sure and now he had just confirmed it. She had a decision to make, and after pondering about it for a moment she lean forward and without warning her eyes glowed yellow and her fingernail became claws. She scratched Jake deep enough on his neck to draw blood and watched as it healed into a scar. "From this day forward Jake, I Raizil will be your Alpha of Moonclan and you will be my fighter. Do you promise to honor, and listen to me as your alpha, and dedicate yourself to Moonclan." Rai said formally her eyes still glowering and her power coming off of her in waves. she was accepting the role as alpha because since there wasn't one right now that just showe that there was another wolf who was dominant enough to be one. she stared into his eyes, wondering if he would challenge her. She needed him to show him her neck as a sign of submission or lower his eyes. Jake yelped, not expecting the scratch. He was about to yell at her, and call her things better left untyped, when her words filled his ears. It made sense all of a sudden. She was marking him as her fighter. As soon as she finished her speech, he pushed ears and a tail out, instantly tucking his tail beneath his legs, his ears laid back, as his gentle green eyes looked down at the matching grass. 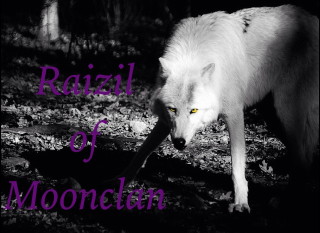 "Raizil, I accept you as my Alpha, and will strive to protect and serve you and the clan as a loyal fighter." He said. He didn't dare move until Raizil gave him permission to. Raizil smiled then and grabbing her stuff she nodded to Jake. "Raise Jake, and let us go back to Moonclan's territory. There is nothing here for us now. Will you lead the way since I don't know the territory." She asked a slight blush of embarrassment decorated her cheeks. Her features were back to normal and she reigned in her power, she hated to have to do that to him but it was necessary. Jake slowly rose to his feet, the tail and ears disappearing. When Raizil asked him to lead her, he bowed, a fist over his heart. "Yes, my Alpha." He said respectively, turning to walk home. He began walking at a somewhat slow pace. Jake might have been a jerk, but both his love for Raizil and her new authority brought out this side of him. Rai's eyebrow twitched because she wasn't use to being called alpha. "Jake when it's just us there is no need for you to call me alpha." She said following after him. Jake looked back at her for a moment. "Ok Raizil." He said. He picked up his pace, trying get back faster. He felt he was displeasing Raizil. Raizil started to pick up the pace, as Jake started to walk faster. She wondered if he was mad at her. She would ask him later when she got a chance. She was very excited to see Moonclan's territory but it psomewhat put a damper on her mood when she thought about the fact that she would have to see Casper and Eliza again to announce to them that she was now the leader of Moonclan. Sighing she followed her new fighter into her new home. When Laura got here she started looking for a target or something to practice with. She hopped over the river and found an abandon wagon filled with square hay bales. She picked them up one at a time and set them somewhere. She set one in a tree that was right next to the stream, one next to that tree, one on a dry stone that was in the middle of the river and another one next to a bush that was on the other side of the stream. She then went to the side the bush was on and took about 30 huge steps behind her. She took out her knife that had a sun symbol on it and aimed the knife to hit the middle of the hay bale next to the tree. While it was in her hand it started shining bright and then her eyes turned a bright sky blue. She threw the knife with all her might and hit the hay bale right in the middle. To her surprise she watched as the knife actually went through the hay bale and was stuck in a tree that was behind it. She covered her mouth with her hands her face very surprised. "Oh my god! Oops!" She yelled out and went to retrive her knife. The blonde man watched the girl have throwing practice with her twin swords. They glowed which was unusual, but whatever was unusual was normal for him now. With a few slow blinks, he decided to say something and to stop cowering in the bushes like a fool. He stepped out noiselessly onto the opposite pebbly shore, but a few stones rolled across each other as he took a few steps. He looked up at the female with a tipped hat. "Laura." He greeted her with a slight nod and a small smile. "It's good to see you are well." He strolled towards her and stopped just a few inches from the water. He set his cane in front of him and leaned forward a little. "You seem very excited about the battle yet to come. 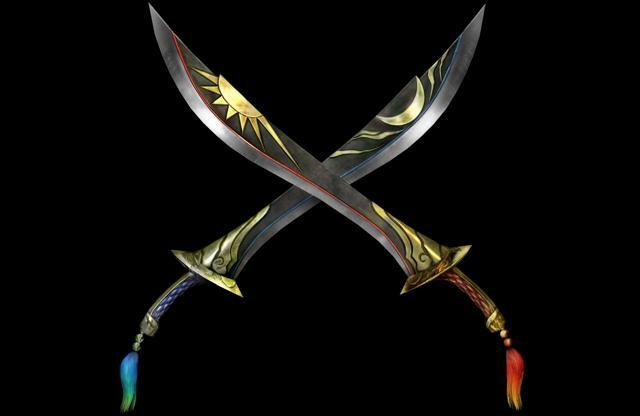 Haha, you'll get plenty of time to show off that impressive array of weapons you have." He said waving his hand as if shooing away any casualties that would have followed his slightly rude comment. He made it sound as if she was a child excited to go to the park and play with her friends. The battle was going to be very bloody. Anyone could figure it out by the tense atmosphere just over flowing from both territories. It seemed impossible no one in the village could sense it. However, everyone seemed eager to destroy the other. 'I don't know what goes through their minds. Then again, I am a made vampire...' With an inward sigh, the healer awaited Laura's answer. Laura turned to the voice. It was Blank. She smiled and waved to him and then pulled the knife from the tree. She then ran back to the side of the creek she threw her knife from. "I'm not really excited for the battle, I basically practice with my weapons everyday so." She replied back not even looking at Blank but looking at the hay bale in the tree. She took out her knife with a moon symbol. "Plus I don't really consider werewolves as my enemies because of my history. Only people who threaten the clan is my enemy." Laura replied. She aimed the knife at the hay accept this knife didn't have a bright light shine it had a darkish hue to the blade instead. Her eyes turned to a darker blue and then she threw the blade at the hay bale in the tree tops. And then again it went through the hay bale and got stuck in a tree behind the hay. "Damn it." Laura muttered and ran to the tree it was stuck in to retrieve it. OOC: I was afraid this would happen, just not as quickly . He has no name, so he's basically just *Blank*. In the clans he's known as Baron, and Elliot in the village. Don't worry about it, just a misunderstanding on my part. The girl returned his greeting with a simple wave of her hand. Her smile was as open as ever. With an exasperated laugh, the vampire crossed the stream over to her. She had pulled her sun knife out of the tree, and now aimed her other twin sword at another hay bale. His royal blue eyes strayed over to the wheelbarrow, slowly being overtaken by the forest. His eyes crinkled at the sight, but he returned his gaze over to Laura. She had replied without looking at him, not that it mattered, he much preferred to be ignored rather than be aimed at with a large sword. "You'll need plenty of practice if you wish to master every single weapon you have. Well, you may have already mastered all of them." He said with another smile. A thump resounded through the trees. The sword had once again impaled itself in the tree. Laura muttered a curse, earning a chuckle from the healer. The blonde man watched Laura climb the tree to retrieve her sword. He recalled the dark blue hue the sword had taken on, then how her eyes had turned a similar blue. 'They're extensions of her now. She's more excited than she thinks.' Baron smirked, but decided to change the subject. "You should get some rest. Battle training will start soon. Anubis will work us all to the bone. Including me." He wasn't very excited about training. He preferred to keep his sword fighting skills covered up, he was always underestimated that way. A healer is never expected to fight, nor to learn to love fighting. Not that he liked it, just seeing people's surprise was enough for him. "And be careful. We'll need every fighter we have in this battle." He said laughing to himself. He knew the girl was very experienced in climbing trees, especially back flipping off of them. 'Not that it would work for me. I'm not good going around in circles.' The blonde man pulled his hat back so he could look up at the girl climbing the tree. "I have already mastered my weapons pretty well but, the weapon I am most skilled with is my scythe." She replied from the tree and pulling my knife out from it. When she had her knife she put it in the holder of her belt and jumped down to land next to Baron. "Well I guess I will practice later then so I can relax a bit." She replied with a smile. "I will be in my tree if ya need me." Laura said and she walked off in the direction of her tree. The blonde man hummed thoughtfully when she replied about her scythe wielding skills. He was impressed. A peaceful and polite lady knew how to fight, and she knew how to fight very well. He stepped back as Laura came in for a landing nearby him. The spray of dead vegetation missed him by a few inches, but a few clods of dirt landed on his shirt, which he brushed off nonchalantly. "I shall see you later tonight, Laura." He said once again tipping his hat to the girl. With a smile, he strode off into the trees once again.